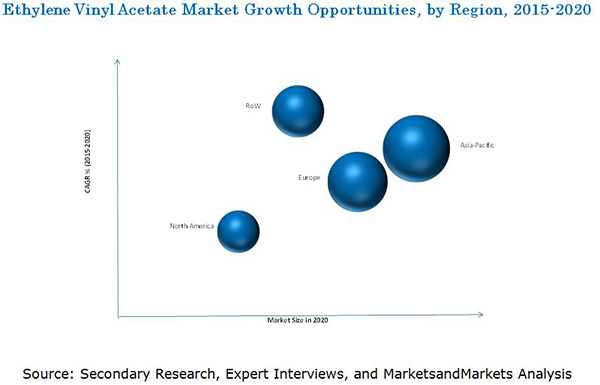 [159 Pages Report] The global ethylene vinyl acetate market is projected to be worth USD 9.71 Billion by 2020, registering a CAGR of 3.5% between 2015 and 2020. In this study, 2013 has been considered as the historical year, 2014 as the base year and 2015 to 2020 as forecast periods for estimating market size of ethylene vinyl acetate. In this research report the market for ethylene vinyl acetatehas been categorized based on type, application, end-use industry and region, and it includes forecasts for market size growth and analysis of trends in each of the submarkets. This research study used extensive secondary sources, directories, and databases, such as Hoovers, Bloomberg BusinessWeek, and Factiva to identify and collect information useful for this technical, market-oriented, and commercial study of the ethylene vinyl acetate market. The primary sources are mainly several industry experts from core and related industries and preferred suppliers, manufacturers, distributors, service providers, and organizations related to all segments of the industry’s supply chain. The bottom-up approach has been used to estimate market size of ethylene vinyl acetate, type, application, end-use industries, and region, in terms of value and volume. The top-down approach has been implemented to validate the market size, in terms of value and volume. With the data triangulation procedure and validation of data through primaries, the exact values of the overall parent market size and individual market sizes have been determined and confirmed in this study. Vinyl acetate monomers (VAM) and ethylene are the primary raw materials required for the manufacturing of ethylene vinyl acetate. Raw material suppliers are the basic chemical companies providing vinyl acetate monomers and ethylene to EVA manufacturers. Companies supplying basic chemicals are the chemical companies, such as Exxon Mobil Corporation (U.S.), The Dow Chemical Company (U.S.), LyondellBasell Industries NV (Netherlands), and others. Ethylene vinyl acetate manufacturing companies manufacture different grades of ethylene vinyl acetate using different polymerization processes differ with regard to inhibitors, pressure, temperature, and initiators type and concentration. These grades are further used in wide variety of applications. This study answers several questions for the stakeholders, primarily which market segments need to be focused in next two to five years for prioritizing the efforts and investments. These stakeholders include the EVA manufacturers, EVA traders, distributors, and suppliers, end-use market participants of different segments of EVA, government and research organizations, associations and industrial bodies, research and consulting firms, R&D institutions, environment support agencies, investment banks, and private equity firms. On the Basis of Type: The ethylene vinyl acetate market is segmented on the basis of types that are, VLEVA, LEVA, MEVA, and HEVA. Each type is further described in detail in the report with value and volume forecast till 2020. On the Basis of Application: The ethylene vinyl acetate market is segmented on the basis of application that include film, injection molding, compounding and wire & cables, extrusion coating other extrusions, and other non-extrusions. Each application is further described in detail in the report with value and volume forecasts till 2020. On the Basis of End-use Industry: The ethylene vinyl acetate market is segmented on the basis of end-use industry that include footwear & foams, packaging, agriculture, pharmaceutical, photovoltaic panels, and others. Each end-use industry is further described in detail in the report with value and volume forecasts till 2020. On the Basis of Region: The ethylene vinyl acetate market is segmented by region as Asia-Pacific, Europe, North America, and RoW. Each region is further segmented by key countries such as China, India, Japan, the U.S., Germany, Italy, the U.K., and Spain. The global ethylene vinyl acetate (EVA) market size, in terms of value, is projected to reach USD 9.71 Billion by 2020, at a CAGR of 3.5% between 2015 and 2020. The high potential from the packaging and footwear & foam industry, increasing global demand for EVA in solar energy sector, and continuous expansion and merger & acquisition activities undertaken by different companies are the key factors for the growth of the global EVA market. The medium density ethylene vinyl acetate (MEVA) is projected to be the largest and high density ethylene vinyl acetate (HEVA) is projected to be the fastest-growing type of EVA between 2015 and 2020. MEVA is the most preferred type of EVA due to its extraordinary characteristics and wide spectrum of applications in all the major industries. HEVA is projected to grow at a significant rate in future as they are being used preferably in solar energy sector. In addition, the increasing demand for HEVA in compounding and wire & cable application is also driving the market of this segment. The footwear & foam industry is the largest end-use segment with maximum of EVA market share in 2014. Characterized with excellent impact & vibration absorption, weather & chemical resistance, acoustic & thermal insulation properties and buoyancy with low water absorption, EVA is significantly accepted as a material of choice. It is neither used as plastics nor as rubber, but is preferred in the form of foams to manufacture midsoles in the footwear industry. Films application is the largest application in the global EVA market. This is due to the increasing usage of film in major industries, namely, footwear, packaging, solar energy, agriculture, pharmaceutical, and other sectors. Compounding and wire & cable is the fastest-growing application for the EVA market due to its excellent characteristics such as flexibility and elasticity, excellent adhesion, good low temperature resistance, good compatibility, greater solubility in organic solvents. Owing to these properties, EVA insulated cables are majorly used in the power and telecommunication sectors. Asia-Pacific, being the largest market for EVA is also projected to register the steady growth, between 2015 and 2020. Accelerating demand from end-use industries such as footwear & foam, packaging, agriculture, pharmaceutical, and other in Asia-Pacific is driving the growth of the EVA market. Tremendous development in infrastructure and increasing demand for extrusion coatings, hot-melt adhesives, films, injection molded parts, and other application in various end-use industries is expected to drive the EVA market in this region. The region has high scope for EVA market due to increasing manufacturing and industrial base. Though the EVA market is gaining importance at a good pace, but few factors are restraining the growth of EVA market. The introduction of low density polyethylene (LDPE), as a substitute product is the major restraint towards the growth of EVA market. LDPE comparatively being low cost possesses nearly the same properties as EVA and is fit for applications such as packaging, injection molding, and film applications. The companies such as The Dow Chemical Company (U.S.), ExxonMobil Corporation (U.S.), LyondellBasell Industries NV (Netherlands), and E.I. du Pont de Nemours & Co. (U.S.) are the dominant market participants in the global EVA market. The diverse product portfolio and strategically positioned R&D centers, continuous adoption of development strategies, and technological advancements are few factors that are responsible for strengthening the market position of these companies in the market. They have been adopting various organic and inorganic growth strategies such as expansions, mergers & acquisitions, joint ventures & collaborations, and new product launches to enhance the current market scenario of EVA. 13.2 E.I. Du Pont De Nemours & Co.